The word "Na'vi" in Hebrew means "prophet". A Na'vi is a visionary or someone who communicates directly with god. Its pleural "Nevi'im" refers to the prophetic books of the bible including Judges, Kings, and Isaiah. "Avatar" is Sanskrit for "incarnation". It is used extensively in Hindu scriptures to refer to human incarnations of God. According to James Cameron, the Na'vi are blue to create a conceptual parallel with traditional Hindu depictions of God (e.g., in the forms of Vishnu, Shiva, Rama, Krishna, etc. ), but also because "I just like the color blue." Ey'wa, the deity of the Na'vi people, is a mixed-up pronunciation of "Yahweh", the God of the Hebrews. Matt Damon and Jake Gyllenhaal were the studio's first choice to play Jake Sully, but James Cameron decided to cast an unknown Sam Worthington in the lead role. 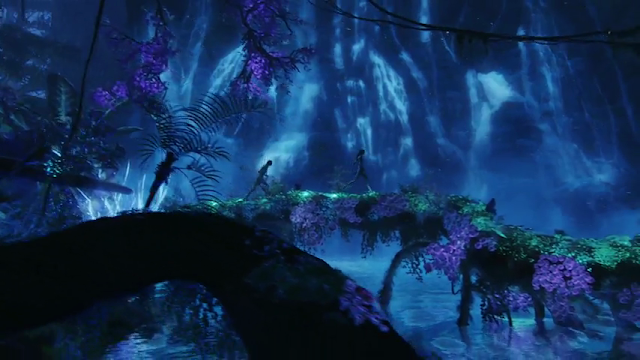 Promotional items for Avatar were shipped to cinemas under the name "Project 880". In the UK, the film was shipped in two parts, under the code name "Redbird". Reels 1-5 were delivered first; 6-10 came the following day. To help the actors prepare for their roles, director James Cameron took the cast and crew to Hawaii, where they spent their days trekking through the forests and jungles and living like tribes (building campfires, eating fish, etc), in order to get a better sense of what it would be like to live and move around in the jungle on Pandora, since there would not be any actual jungle sets to aid and guide the actors and crew. Zoe Saldana even dressed up as a warrior during these journeys, complete with an alien tail symbolic of the one her character has in the movie. These hikes were only done during the daytime, though; the cast and crew spent their nights at a Four Seasons hotel. One of the most expensive movies ever made (as of December 2009), with an estimated budget of US $280,000,000. 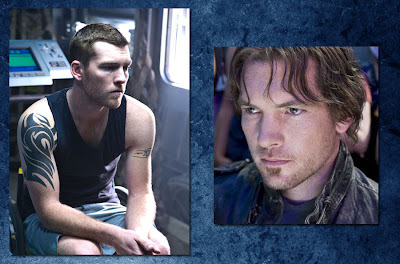 Sam Worthington appeared in Terminator Salvation (2009), the fourth Terminator movie. His appearance in this non-Terminator movie is notable as James Cameron directed The Terminator (1984), Terminator 2: Judgment Day (1991), T2 3-D: Battle Across Time (1996) as well has having being a writer (creator of characters) on other Terminator franchise video-games and TV episodes. The first time Sigourney Weaver has appeared in a James Cameron film since Aliens (1986). Avatars have eyebrows, toes and five fingers, whereas the Na'vi only have four fingers and no eyebrows. The Avatars are also broader in the chest and arms, appearing more 'muscular'. The Na'vi language was created entirely from scratch by linguist Paul R. Frommer. James Cameron hired him to construct a language that the actors could pronounce easily, but did not resemble any single human language. Frommer created about 1000 words. Though he is not credited in the film, several locations look very similar to paintings by English surrealist Roger Dean, most notably his works "Floating Islands" and "Arches". In the Thai version, Jake Sully is a "Navi" who becomes a "Na'vi". The Thai word for Marine is "Na-vig-ga-yo-tin", but the translator shortened it to make the voice-over sync. "Unobtainium" is a humorous term used mainly in the aerospace industry. It describes a material that is perfect for an application, but does not exist, is extremely expensive, or violates the laws of physics. Its chemical symbol is Uo. "Unobtainium" is also a general concept term used by sci-fi enthusiasts for any fictional substance that is needed to build a certain device that is crucial to the plot of a sci-fi story. "Unobtainium" is featured in the movie The Core (2003), where the earth-boring vessel called the "Virgil" has a hull made from unobtainium to help it withstand the massive pressures inside the Earth's core. "Unobtainium" is also an anti-gravity element in the online multi-player video game "Skyrates." In Korean, "Na'vi" is spelled like "nabi", the Korean word for "butterfly". When Sully reassures Mo'at (the shaman) that he is "empty", it refers to his life being empty. The term "jarhead" is applied to Marines referring to their traditional 'high and tight' haircut, and is used by Dr. Augustine when Sully is entering the Avatar link for the first time. WETA and ILM have previously worked together on Contact (1997), Van Helsing (2004), and Eragon (2006), making 'Avatar' their fourth collaboration. The first (and only, as of 2010) science fiction feature film by James Cameron that does not involve or mention nuclear weapons. When Jake Sully is ready to choose a woman, Neytiri tells him about the women in the tribe, starting with "Ninat is a great singer". One of Israel's leading pop singers (Ninette Tayeb) is called Ninet. Colonel Quaritch mentions that being on Pandora made him feel "like a shave-tail Looie." "Shave tail" was a term originally used in the 19th century among U.S. cavalry regiments. Newly assigned cavalry troopers were given horses with a shaved tail, to let other troopers know that the rider was dangerously inexperienced, and should be given extra room to maneuver during training. "Looie" is a nickname for lieutenant, the lowest ranking, and least experienced, rank among U.S. Marine Corps officers. Avatar is James Cameron's first directorial feature film since Titanic (1997). Each frame (1/24 of a second) of the CGI scenes took an average of 47 man-hours to complete. The film reached the US$500 million dollar mark in 32 days, beating The Dark Knight (2008)'s previous record of 45 days. James Cameron's previous film, Titanic (1997), took 98 days to reach the US$500 million dollar mark. The concept of a network of trees in which minds of the deceased continue to exist appears in several novels of the "Ender" series by Orson Scott Card, most prominently in "Speaker for the Dead". Just like in the movie, the trees in the novel are sacred to the native (remotely humanoid) inhabitants, who tolerate the presence of a small human colony on their world until cultural misunderstandings lead to conflict. James Cameron disclosed on "The Tonight Show with Conan O'Brien" (2009) that he began working on preliminary drafts of his movie as early as the mid 1990's. Because his visual concepts were so avant-garde, the technology required to consummate his vision was not then yet available. Not until 2005 was he able to proceed with viable script scenarios. First movie to ever cross the US$ 2,000,000,000 mark worldwide (and later the US$ 2.5 billion mark), making it the highest grossing film in history. Jodie Foster was considered for the role of Dr. Grace Augustine. According to Sam Worthington, he was invited to the casting via a phone call. Who called told him nothing about the script, nor even told the director's name and Sam was disappointed at first, thinking it was "another waste of time". In the original draft Jake's original name was Josh while Neytiri was named Zuleika. When Trudy (Michelle Rodriguez) refers to them needing to fly VFR what she is referring to is the Visual Flight Rules, where a pilot, accurately enough, needs to see where they're going. According to Jake's video logs, the entire film (on Pandora) takes place over a 96-day period. The first log is dated 05/19/2154 and the last 08/24/2154 - 3 months and 5 days later. James Cameron wanted an unknown actor to play Sully, because it would give the character a "real" quality. The guy you want to have a beer with, who ultimately becomes the leader that transforms a whole world. To appease 20th Century Fox's fears, and remembering the harrowing experience of Titanic (1997) and its production overruns and costly delays, James Cameron promised to forgo his director's fee if Avatar (2009) flopped. Now THAT's artistic dedication! Though James Cameron has mentioned Roger Dean as a possible influence on the landscapes, another who could also be possibly cited as an influence on the picture is Anne McCaffrey, whose 'Dragonriders of Pern' series of books center around the relationships between humans and dragons that involves a melding of the minds - in her books, a psychic link that takes place at the birth of the creatures. The dragon riders, not unlike their brethren in Avatar, fly around in squadrons protecting their home planet. There are striking similarities between the movie and the "Destination: Void" universe depicted by Frank Herbert and 'Bill Ransom' in the science fiction novels 'The Jesus Incident' and 'The Lazarus Effect'. In the novels, an alien planet called Pandora is home to a global network of sentient kelp in which the minds of the deceased also continue to exist. The kelp, as well as other native lifeforms on the planet, are linked into a large entity with a shared consciousness, called "Avata". The joystick and throttle used to remote-control the bulldozer is a set of modified Saitek X52 Pro. Those are designed to control airplanes in flight and combat simulator programs. The common spirit of Pandora where every creature is constantly connected to each other and the planet itself is based on the concept of Gaia described in Isaac Asimov's novel 'Foundation's Edge' (1982). SPOILER: In the scene where Jake Sully is in prison, his back is to the camera and you can see the back of his wheelchair. The brand of wheelchair he is in is "Grunt", which is another term for a Marine infantryman. SPOILER: In the final battle sequence, Neytiri has a white hand print on her chest as part of her warpaint. It has five fingers, indicating that it is Jake's hand (avatars have five fingers while Na'vi only have four). SPOILER: Sully and Neytiri only actually meet face to face at the end. SPOILER: Stephen Lang has hinted that Colonel Quaritch could return for a sequel: "You think those two arrows in my chest are going to stop me from coming back? Nothing's over so long as they've got my DNA."